Everyone always asks how prices are doing in SW Florida. The next question is usually along the lines of how are distressed sales such as foreclosures and short sales affecting the market. We have new numbers just released that will help answer these two questions. Sales have been falling the past several months as they usually do this time of year. This is also influenced by fewer listings on the market. We have demand but limited supply. Traditional sales are down as well as short sales and foreclosures. 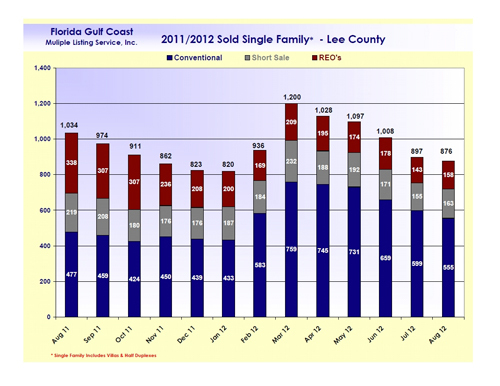 As you can see from the attached chart, we had 158 foreclosure sales for single family homes in Lee County in August. This is down from the peak in March of 209 this year. Short sales are also down from their peak in March. It seems March was the peak for all three types of sales. SW Florida is in that no-man’s land we predicted several years ago. Our prediction was inventory will be less and prices will rise, but not enough to encourage many homeowners who are underwater but hanging on. Our market is set to take off on the price-wise to the upside, but one thing is holding it back. In a word, it’s the Economy. All signs point to upward price pressure. We have demand and limited supply, but incomes are not rising and we don’t have jobs to support enough full time end users with good enough credit. SW Florida is littered with people who would like to purchase but have suffered a foreclosure or short sale themselves, so they are precluded from getting a mortgage for awhile. Even if they have regained full employment it’s difficult to get financing. Many people are still hurting in SW Florida, and many more moved away perhaps never to return. When Florida’s economy returns we have the potential for some nice price appreciation. Mind you, we think inventory will increase as prices rise. People who are barely underwater may not be with future price increases. So many are locked into a home that no longer meets their needs, but they can’t sell right now without facing difficult decisions. As prices rise options will open up for some. Others are so far underwater it may be some time before they’ll be able to sell. Florida still has sunshine, the beaches, year round golf, and provides for an active lifestyle year round that is attractive to baby boomers who wish to retire or spend time in a nice climate as a second home. As the national economy improves more service sector jobs will be required. Along with those jobs typically comes construction jobs, and with that the cycle develops. We’ve seen the beginnings of construction jobs here in SW Florida, but they’re peanuts to what they were. The good news is Florida is a desirable place to spend time or live, and SW Florida is amongst the best places in Florida. We live in paradise, and the future looks bright. Our market is still healing while all signs look to positive gains. The gains are when, not if. Time will answer how fast the market improves, and we believe the economy will dictate the pace. If you’re looking for your piece of paradise, you could wait, but why? Prices are going down. They will rise, and the investment alternatives in stocks, bonds, and even precious metals are dicey. Returns are just hard to come by without taking huge risks, and the paltry returns usually aren’t worth the risk. Real estate may be the least risky and offer more to the upside. At least you can rent out or live in a house. It’s hard to rent out or live in a commodity. If you’d like help securing your piece of paradise, feel free to call the Ellis Team at RE/MAX Realty Group 239-489-4042. We present you with your options and help you make a good decision for you. We’re testing a New MLS Search Site. Click to view properties throughout SW Florida and let us know if you like it better than our Leecountyonline.com Search Site. Does ObamaCare Raise Taxes on Real Estate? We hear a lot of talk and rumors about ObamaCare and what its effects will really be on business and real estate. Perhaps it’s a mystery because the new tax in the legislation was never introduced, debated, or reviewed until just hours before its passage. Remember when Nancy Pelosi said “We must pass this legislation to find out what’s in it”? She wasn’t kidding. Nowhere was a new tax on real estate or capital gains talked about before its passage, so of course people are asking questions now that the new tax is set to take effect after the election. Does ObamaCare Raise Taxes on Real Estate? With that said, it’s a new tax that isn’t going to affect everyone, so that’s the only silver lining. They needed this revenue because Medicare is set to run dry in a few years, so this new tax will supply $210 Billion over 10 years and will help to extend the life of Medicare a few years. Here is the breakdown as we understand it. There are 2 new taxes. One is a 3.8% tax on unearned income like interest, dividend, rents, capital gains and the second tax is a .9% tax on income such as salary, wages, commissions, etc. The 3.8% tax will apply to individuals with an adjusted gross income above $200,000 and couples filing a joint return with more than $250,000 adjusted gross income. Once you meet those criteria, there are complicated formulas we won’t go into here. It’s probably best to consult with your accountant on that. Nobody knows what will happen if upper income people decide not to sell. It would negatively impact Florida’s doc stamp program and revenue to the state, and it would cut income to Medicare which is in deep trouble anyway. Sneaking a tax in at midnight to cover Medicare probably wasn’t the best way to save Medicare. Will the Fed’s New Stimulus Help Housing? The Fed has promised to pump money into mortgage backed securities as a way to buy down interest rates, also knows as the QE3 Stimulus. Nobody knows what effect it will have on real estate. All we can say is it couldn’t hurt. However, rates have been low and the market is still relying on the overall economy to improve. This action by the Fed will reduce borrowing costs, but it will also reduce rates paid to savers like senior citizens. Seniors today cannot be happy. We may see real inflation creep up and rates stay low, so seniors will actually lose money on the deal. Real estate accounts for about 32% of GDP, so anything that gets real estate going may help the economy. We believe that real estate and the economy need each other. Having a balanced budget, lower taxes, and leadership in Washington where business could plan would best stimulate the economy and help real estate. A rising tide lifts all boats, and we think real estate would take off if Washington tried this approach. It’s a rather simple equation and yet our government is so divided we’re not sure that will get done. So for now all we can do is report the effect the ObamaCare taxes will have on real estate transactions. Last time I checked we had about a 4 Year + supply of $1 million homes on the market. Taxing those transactions further won’t do anything to help housing. I’d really like to know whose bright idea this was to sneak this tax in at midnight. What happened to Obama’s promise of transparency and all bills would be viewable to the public for 3 days before a vote? Was that just an empty campaign promise? 4 years later these things matter. Taxes are set to rise in 2013; some from ObamaCare and some from Congress’ inability to pass a budget. Did you know the Senate hasn’t passed a budget in 3 ½ years? They just keep passing continuing resolutions and raising the debt ceiling. Keep your eyes open. If we find any other new taxes they try to sneak in on us we’ll be sure to point them out. Posted in Cape Coral, Cape Coral Real Estate, Fort Myers, Fort Myers Real Estate, Southwest Florida Real Estate. Are you one of thousands of homeowners wondering what happened to your property insurance discount in Florida? Perhaps you paid money for an expensive inspection that entitled you to property insurance discounts on your homeowners insurance for things like wind protection. Florida law requires insurance companies to offer homeowners discounts or credits for existing building features or home improvements that reduce damage and loss from hurricanes. Florida insurance companies are required to file these discounts with the Office of Insurance Regulation. Has Your Insurance Company Raised Your Rates? The discounts apply to your wind portion which accounts for 15 to 70% of your total premium, depending on where you live in Florida. We’d encourage you to check out MySafeFloridaHome.com/insurance.asp for more information. Having moved here from State Farm Country in Central Illinois in the ‘80’s I was a loyal State Farm customer for all those years until last year. I started receiving letters stating that State Farm wanted to re-inspect my home, ignoring the reports I had presented years prior that entitled me to wind protections discounts. Low and behold an inspector came out, looked around, and left. He didn’t ask me to show him anything. Next thing I know I received a letter denying my discounts. I asked for a re-inspection. That was denied. I asked them to look at my reports. They did and said it didn’t qualify. I provided copies of the permit and State Farm said the wind resistance tests weren’t with the documentation. Keep in mind the inspector looked into none of this. This was a failed test designed from the get go. I provided the engineering and testing reports provided by the manufacturer. These products were tested and accepted by the state, but not State Farm. A loyal customer of State Farm for over 30 years was forced to switch. I’m sure State Farm isn’t the only company stingy with the discounts. Citizens has made news the past few months after employing the same tactics. 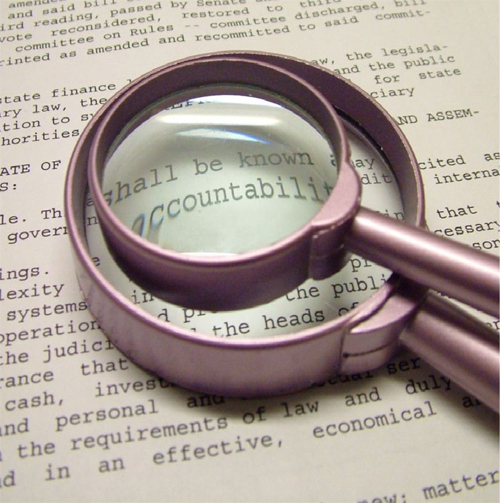 Citizens has received complaints stemming from their reinspection program that has resulted in 3 out of 4 property owners receiving rate hikes due to the new inspection. So far Citizens has inspected 257,000 properties, so that’s about 192,750 affected customers. Due to the complaints, Citizens board of directors has decided to reform its reinspection program, hire an auditor, and improve its customer relations department. I’m still waiting on State Farm to do the same. Property owners will now have a year to dispute the rate hikes. Owners can request another inspection free of charge. If an inspector previously could not enter an attic a home was denied automatically, but that’s not the case on the reinspection program. I saw another report this past week that said the state has built up a $6.2 Billion dollar fund due to lack of hurricanes. I realize one big hurricane in a metropolitan area can change all that, but it would seem to me these insurance companies could pass along the savings for homeowners who have complied and strengthened their homes. Don’t set guidelines, ask people to spend money and follow them, then jerk the discounts away. These people have spent good money to protect their property which in turn should lower insurance costs. It seems the people are keeping their end of the bargain. And now it’s time insurance companies keep theirs. We suspect this has happened to many here in SW Florida. If it has, call your insurance company. Let your elected representatives know. If it’s important to you, it will become important to them. Together we all pay, and together our thousands of voices will be heard, and hopefully together we’ll all save. Feel free to share your insurance stories here. We have one of the best assistants on our team. We used to call her our courier, but she’s so much more than that. Now we just call her Jane of all trades. She still goes out to our properties, takes photos, measures them, and makes sure everything is in order. Additionally she calls agents for feedback on our showings, answers our phones, and much more. She also has a knack for picking up on small details others might miss. She just knows when something isn’t right, and she’s not afraid to ask questions. She also has the uncanny ability to predict things. The Future is Written. She brought in her copy which showed we’d experience a tropical system in June and another at the end of August. Well, we had Tropical Storm Debbie in June and Tropical Storm Isaac at the end of August. Today for the first time in my life I decided to purchase my own Farmer’s Almanac. It is a slightly different version than Jane’s, but similar nonetheless. This marks an exciting turning point in my life, an Epiphany if you will. I’d always heard of the Farmer’s Almanac but was never motivated to purchase one. Skimming through it this morning I notice it predicts a drier than normal summer up North. I looked at the Midwest and it says warmer and drier. That pretty much sums up the drought they’re experiencing. For Florida it shows a cooler and wetter summer, which I would agree with as for much of the summer we barely cracked 90 degrees and we did receive much rain this year. This book even tells you best days to begin a diet, go camping, have dental work done, quit smoking, and more. I have no idea how they know, but I think I’ll have fun reading and testing their information. Admittedly I’ve only had the book a few minutes, but I haven’t come across certain information. Perhaps it’s in there. I’d like to know who will win this year’s election. I’d also like to know if Congress will get serious and actually tackle the debt problem. Will Congress extend the Debt Forgiveness Act so families in SW Florida who are struggling can afford to sell their home without IRS implications? Who will win the Super Bowl? I’d go to Vegas if I find that in the book. The Farmer’s Almanac may be wonderful at prediction weather and certain things and I just wish someone could tell us where our Country is headed. We do our best to predict the local real estate market, but so much is dependent on other factors like interest rates, jobs, the economy, tourism, weather, and the country’s debt. I do know last season was a good one, and it seemed temps were colder up North this past year. Unfortunately the book I just purchased only has weather through October of this year. For instance, it predicts a cooler and drier Sept and Oct for the Atlantic corridor which is Richmond to Boston. I suppose I should have checked the new Lee County Library system which is online. http://library.lee-county.com One of the benefits of living in Lee County Florida is the ability to check out and download books online without having to go to the library. You can check out books for 2 weeks, and there’s never a late fee. Either way I look forward to reading next year’s almanac. Perhaps it will tell us how cold it will be next year up North, which is always a good thing for SW Florida. And now when Jane waltzes in and says we’re in for a major event upcoming we’ll be able to say, “We know, we read it too.” Until the almanac takes over, we’ll keep bringing our local news and analysis. We hope it helps. Good luck and Happy House Hunting!